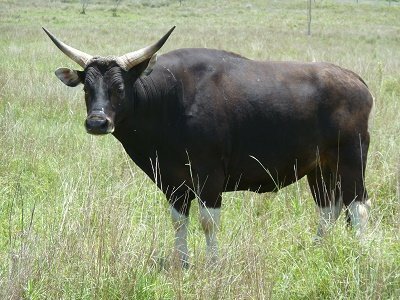 Banteng (Bos javanicus)Appearance: Banteng have a prominent ridge above their shoulders. Mature males have distinctive black and white markings. Younger males and females are tan and white. Weight: Up to 900 kgs (200 lbs). Horns: Are comparatively small with a boss as an attractive feature. Trophy size: Measurements are taken around the base and the outside length of the horn. History: Banteng were introduced to Australia from Indonesia in 1849. Hunting Banteng in Australia: Solitary, and flighty as well as a potential for aggressive behaviour when threatened makes banteng an exciting quarry.